Part 2 – Deploying an advanced setup. As you can see we’ll deploy 3 certificates in this setup. The names I will use for this will be “webaccess.it-worxx.nl”, “gateway.it-worxx.nl” and “broker.it-worxx.nl” for obvious reasons. You may consider using a wildcard certificate. And three certificates. I got mine for free from https://startssl.com. The certificate need to contain the FQDNs you will use for publishing the RD Web Access (webaccess.it-worxx.nl) and RD Gateway (gateway.it-worxx.nl) roles. You’ll also need one for the RD Broker role, even though we won’t publish this server to the internet. The files need to be in .pfx format and you need to have the private key in them. As in the previous guide, this guide will not focus on building a domain using a single domain controller and adding the other servers as member servers to this domain. And again some basic knowledge is assumed in this guide. I will be using Hyper-V 3.0 on my Windows 8.1 laptop and I have prepared 5 servers. The servers will be similar to the 2 I used in the previous guide. All servers have the .NET Framework 3.5 added as a feature. All servers have 1vCPU, 512MB memory, and a dynamic 60GB Harddisk) I configured ITWDC01 as a Domain Controller in a new forest: itw.test. I added the rest of the servers as member servers to the itw.test domain and configured them to use ITWDC01 as their primary DNS server. Log on to the Domain Controller, and in Server Manager right-click the All Servers node and add all other servers using the Add Servers command (or select the All Servers node, click Manage and click Add Servers). Now that all servers needed in this deployment scenario are present, click Manage, and click Add Roles & Features. Select Remote Desktop Services installation. Click Next. Select Session-based desktop deployment. The other option will be a different post in this series. Review the services that will be installed. Click the preferred server and click the Add button. Check Restart the destination server automatically if required. 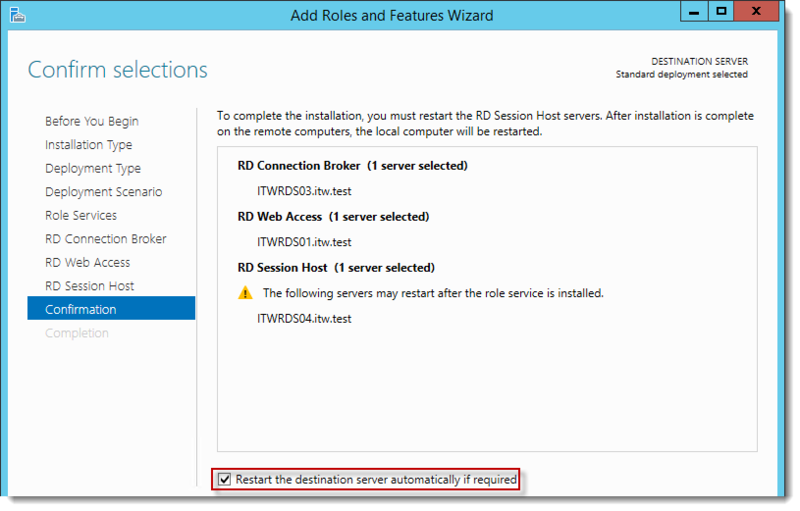 Wait until all role services are deployed and the RD Session Host server has restarted. 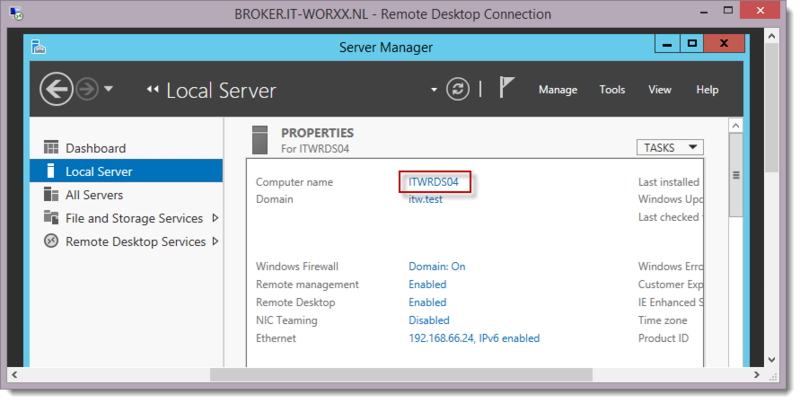 In Server Manager click Remote Desktop Services and scroll down to the overview. Click the Add RD Licensing server button. Click the domain controller and click the Add button. Wait until the role service is deployed. No restart is needed. 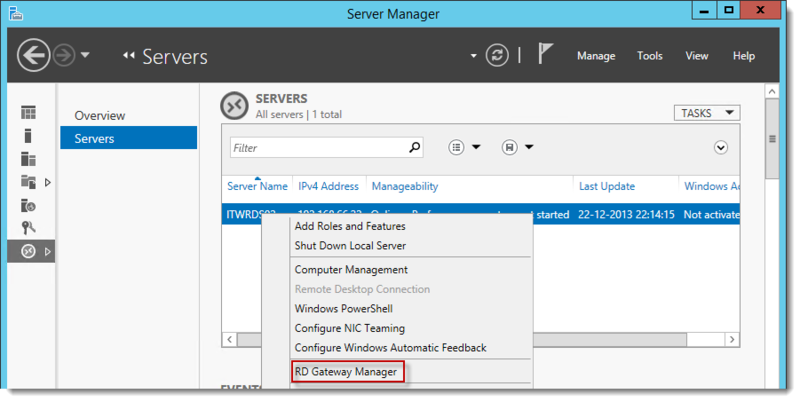 Click the Add RD Gateway server button. Click the correct server and click the Add button. The wizard creates a self-signed certificate. We will deal with certificates in this deployment in a little bit. Enter the external Fully Qualified Domain Name for the Gateway URL. In my case, for lack of a better name, I used “gateway.it-worxx.nl. Notice that “gateway.it-worxx.nl” was configured for the deployment as a FQDN. Also notice that certificate configuration is needed. Notice the link in the bottom to “Review the RD Gateway properties for the deployment”. Click RD Connection Broker – Enable Single Sign On. Notice the purpose of this certificate. Click Browse to browse to the .pfx which you prepared for the RD Connection Broker server, enter the password for that .pfx and check “Allow the certificate to be added to the Trusted Root Certification Authorities certificate store on the destination computers”. Click Apply to apply the certificate changes. Do not click OK because we need to configure the other certificate options as well and we can configure only one at a time. Select RD Connection Broker – Publishing. 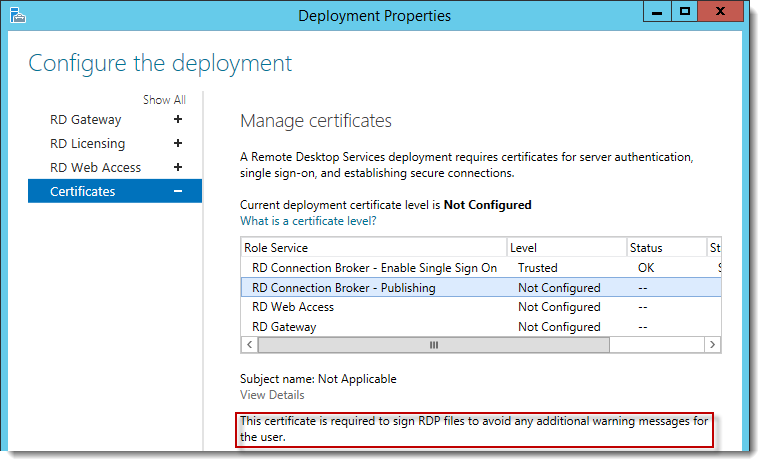 Click Select Existing Certificate and add the same certificate you added for RD Connection Broker – Enable Single Sign On. Click Select Existing Certificate and add the certificate you prepared for the RD Web Access server. Also notice that we need to restart the RD Gateway server after we configured it to use the certificate. 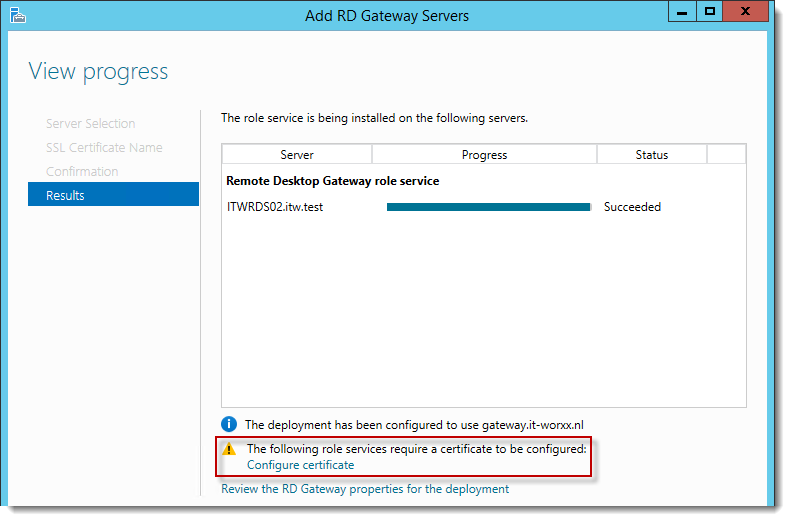 Click Select Existing Certificate and add the certificate you prepared for the RD Gateway server. Click Apply to apply the certificate changes. Do not click OK because we need to configure the rest of the deployment options, since we already have this wizard open. 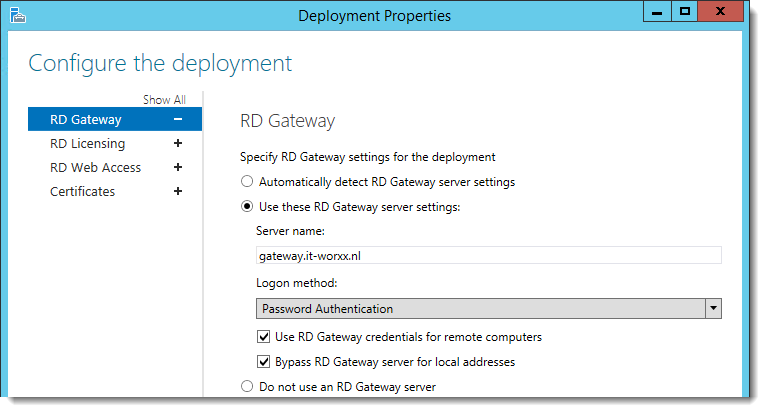 Review the RD Gateway settings and notice what settings are available. 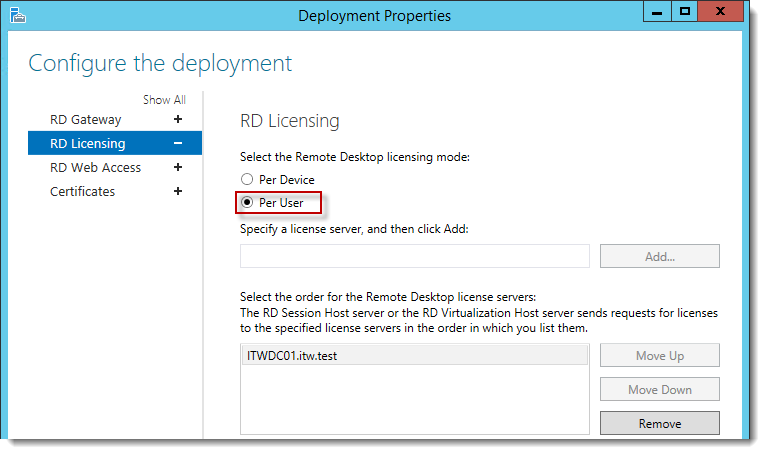 Notice that a RD License server is available, but no license type is selected yet. I selected Per User, but since this is just a demonstration setup, it really doesn’t matter. Click OK, and click Close to finish the RD Gateway wizard. Reboot the RD Gateway server. 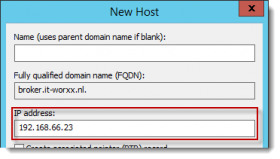 Open DNS Manager on the domain controller and browse to Forward Lookup Zones. Right click Forward Lookup Zones and click New Zone… Go through this wizard accepting the defaults until you have to enter a Zone Name. Enter the external FQDN which will also be used by the Connection Broker (which is also on the RD Connection broker’s certificate. Finish the rest of the wizard accepting the defaults. Browse to the newly created zone. Leave the Name field blank, but enter the member server’s (holding the RD Connection Broker role) internal IPv4 address. Repeat these DNS steps for gateway.it-worxx.nl and for webaccess.it-worxx.nl. We’ve effectively enabled the deployment to be useable by internal users as well by configuring these DNS zones. Create a new Global Security Group called “RDS Connection Brokers” and add the computer account for the member server holding this role to it as a group member. We need this group to be able to convert the RD Connection Broker to a highly available RD Connection Broker. You’ll see why we need to do this in a few steps. Reboot the member server holding the RD Connection Broker role to let it know it’s a member of the RDS Connection Brokers security group. Install SQL Express on the Domain Controller (or use an existing SQL Server if you already have one). For a list of needed features, and a little more detail visit Part 1 of this series, https://msfreaks.wordpress.com/2013/12/09/windows-2012-r2-remote-desktop-services-part-1. That post lists the does and don’ts for using SQL Express with an RD deployment. This includes adding the SQL login for the RD Connection Broker servers. Do not continue with this guide unless you have a working and configured SQL environment. Install the SQL Native Client on the member server holding the RD Connection Broker role (Client Components only). Install the client which corresponds to your SQL Server version! Everything we need is in place to convert the RD Connection Broker, so let’s do just that. This procedure is similar to the single server setup. 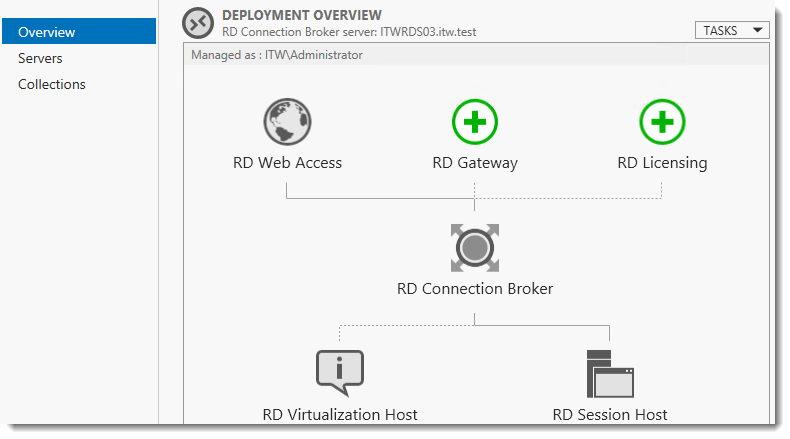 Right click RD Connection Broker and click Configure High Availability. Or any other database name you want, the database will be created by this wizard. I used the instance default folder. Note that this points to a folder on the SQL Server. The DNS Zone name we configured in DNS earlier. And now you see why we had to create this zone in internal DNS as well. This needs to be locally resolvable. The RD Connection Broker is now in High Availability Mode and we are finally ready to complete the configuration. Since the RD Connection Broker is known within the deployment for broker.it-worxx.nl and thus not a FQDN that’s associated with the internal domain (itw.test) we need to tell the gateway that external users are allowed to connect to it. 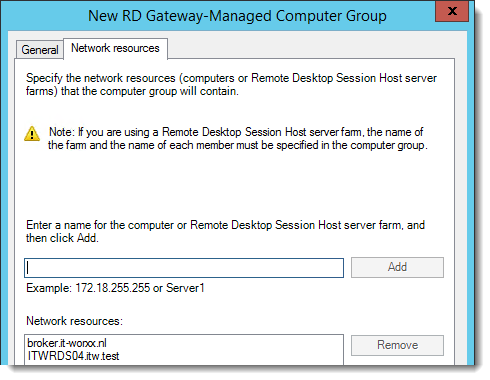 Click Remote Desktop Services (yes, it says it’s missing servers, just ignore this), click Servers and then right click the RD Gateway server. Navigate to Policies – Resource Authorization Policies. There’s the default policy. Right click the default policy and disable it. In the Actions pane to the right, click Manage Local Computer Groups. 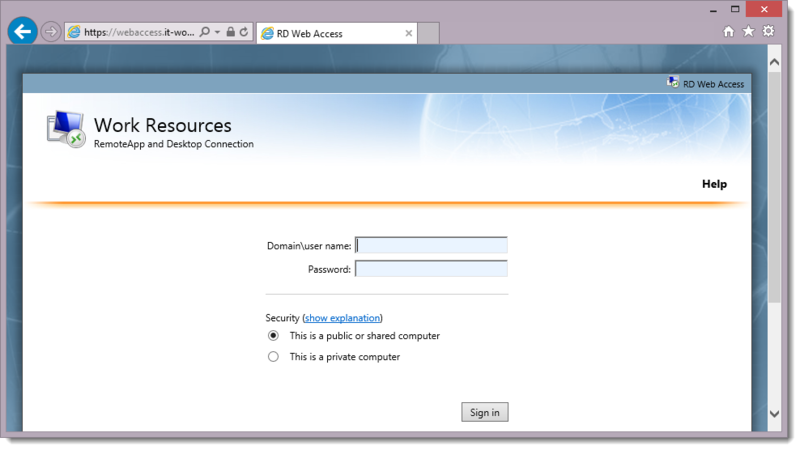 On the Network Resources tab, add the RD Session Host(s) and the DNS external name of the broker. 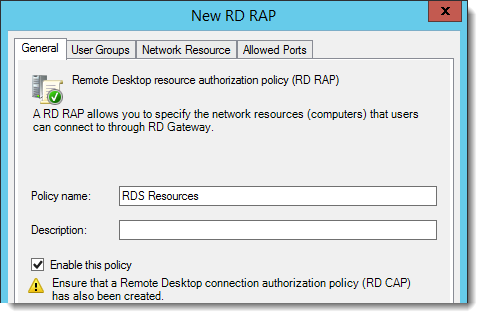 Right click the Resource Authorization Policies node, click Create New Policy, Click Custom. 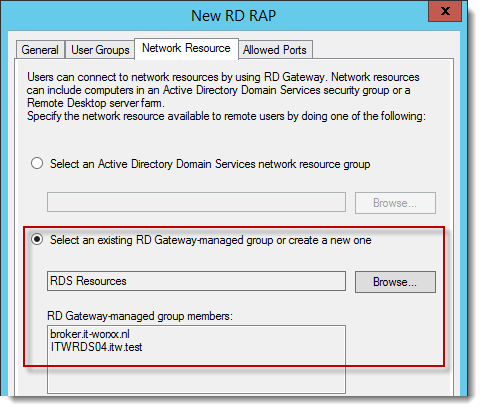 Click Select an existing RD Gateway-managed group or create a new one, and then browse to select the group you created a few steps back. 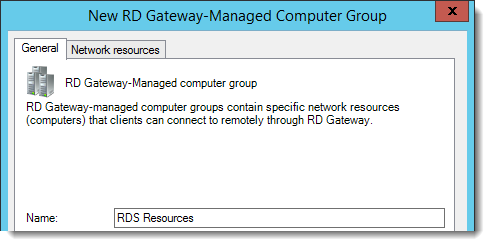 Notice that upon selecting the group the RD Gateway-managed group members box shows the members of the group. Review the Allowed Ports tab. That’s it, configured all servers, configured certificates, configured RAP..
One thing left to do: Tell our RDS environment exactly what to publish. In Server Manager, Remote Desktop Services, Session Collections, click Tasks and click Create Session Collection. Review the requirements. This won’t be an issue in this setup, but you could restrict access to this collection by selecting a select group of people. Enter a descriptive name. This name will be displayed under its icon in the Web Access interface. Click the member server holding the RD Session Host role and click the Add button. You can limit access here. Add one or more groups to restrict access to these groups only. In this setup Domain Users will do fine. First, create a folder on the domain controller “UserProfileDisks” and a subfolder “RDS”. Share “UserProfileDisks”. Now in the Create Collection wizard enter \\itwdc01.itw.test\userprofiledisks\rds and set the Maximum size to 2GB. Further does and don’ts for User Profile Disks will be covered in a future post. Review the information and click Create. Wait until the collection is created and the server is added to the collection. Enter a valid username and password (ITW\username or username@itw.test). Create a user for this, or simply use the domain admin account. After logging in you are presented with the full desktop session collection we created. Again, sorry, but I’ll handle that in a future post. This is just a warning that the resource you’re requesting wants to redirect your local devices. But it also tells us that it is signed by “broker.it-worxx.nl”, and we’re using a gateway to connect to the remote resource..
And when you click Connect, you actually connect. Because I connected as an admin I can see on which server I am logged on by clicking Local Server. And this screenshot also shows that it’s the broker that provided me the connection.. In the next part of this series I will show how to extend this setup with another RD Session Host, but this time we’ll publish some apps. Oh, and that post will probably be a lot shorter. Do you know the maximum number of connections per broker? Not in relation to system specs, but the absolute maximum number of sessions is around 4500. First of all, great guide.. follow, and it looks like the most works. But now i need some help. I have set up the following server. i have created a public IP, pointing to GW01. and certifikate with the public DNS name also. But when i am sitting internaly, i can connect to https://site/rdweb and then chose full desktop. But i will like to connect by MSTSC externaly to the puclic DNS name. Should i point the pucblic to one of the session host server? ore what to do? And.. should it just be port 3389 open to the puclic IP ore? 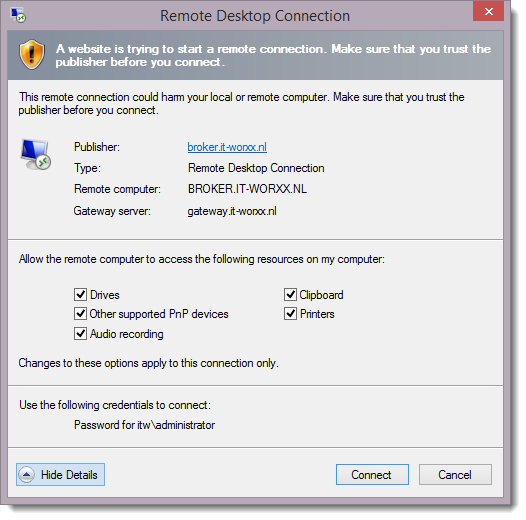 If you want to connect using Remote Desktop Connection (instead of with Web Access) you need to setup the connection using your Gateway as well. For example, the computer you connect to is your Broker and then configure your Gateway settings to be your Gateway server. Make sure you are using the correct FQDN and post the exact error message you see when you try. I am trying to setup my 3-party SSL cert on my 2012 R2 RDS farm. I need to know do I create the CSR cer on my RDS Web Access Server?. I’m wanting to do just that – set this up to use Remote Desktop, not going through web access. The Web Access route works no problem but if i just try using mstsc to the FQDN, obviously it just goes to that specific server (in this case my gw, broker and web access server). I want to be able to mstsc to the load balanced collection. Read the third comment. Ive tried this and it worked perfectly! Hi, I’ll try if someone can help me. I have tried setting up RDS services. I’m getting error: “RemoteApp Disconnected”. “Your computer can’t connect to the remote computer because authentication to the firewall failed due to missing firewall credentials. To resolve the issue, go to the firewall website that your network administrator recommends, and then try the connection again, or contact your network administrator for assistance. 1x WAP Server https://remote.domain.com published. I’ve made relying party trust with ADFS server. I’ve added my ADFS and Remote Desktop server to it’s host file. – Port forwarding 443 -> ADFS Web application proxy server (dmz). 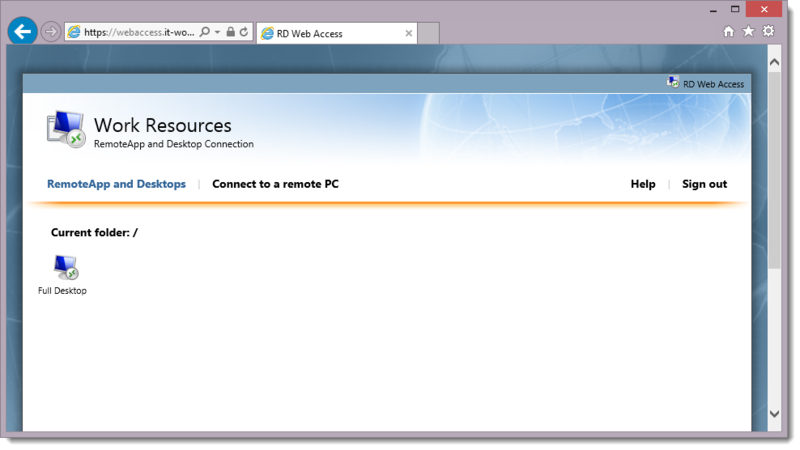 I can log succefully in to my published remote desktop service, but it’s just that I can’t get app open. Your help is greatly valued! thank you if you can help. would be good if you showed how to create an rdp file for the broker so users could have a desktop icon and not have to log into a web portal. Open the webacces site with Edge, Chrome, or Firefox. Clicking the icon will download the RDP file instead of opening it with ActiveX. Is it possible to have the licensing installed on the individual Session Hosts? We’ve seemed to observe that some of our Session Hosts revert back to the trial per user licenses even though you see the CALs installed within the License Manager within the Session Host. The Diagnoser no longer sees it. It is, but why would you do that? One is basically enough, and point all session hosts to that licenserver. If you need a license server per sessionhost than make sure the sessionhost uses that license server via policy or deployment properties. Hi Arjan, thank you for the step-by-step GUI installation of the RDS Services. However, the main reason I came across your page was trying to figure out how to create the .pfx certificates. You just click and choose the ones you’ve prepared. Well, how do you prepare one? What is the process? There is not a single article on the entire planet about it. I guess, you know how to create certificate request in IIS & get cert from either local CA or third party CA. 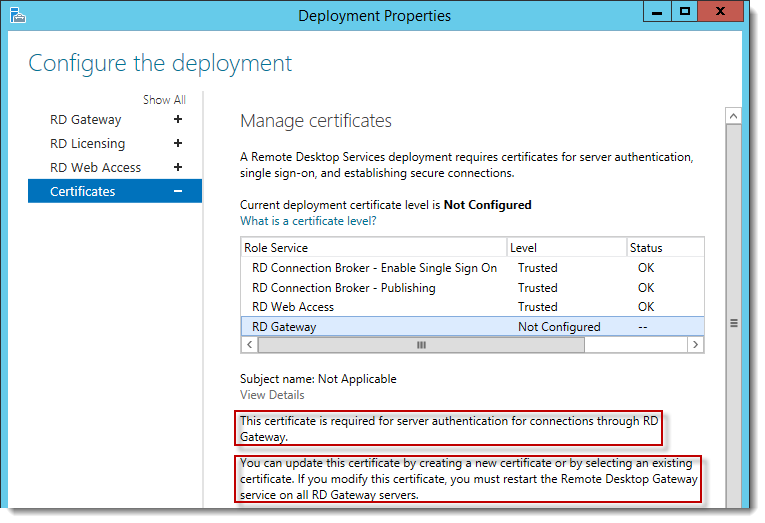 Once you get the cert, you need to install /complete cert request in IIS. Once installed, simple export as .pfx format.